The culinary scene of the 1960s in America was, shall we say, nothing to write home about. A dazzling array of modern conveniences had sucked most of the flavor and soul from dinner plates nationwide, but there were glimmers of hope on the horizon. Julia Child was on the air, changing lives and palates; Alice Waters would open Chez Panisse in less than a decade, shifting the collective culinary consciousness; and The Joy of Cooking was in its 5th edition, the one that firmly cemented its well-earned reputation as an absolute necessity in the home library. It is this edition of the book, and this era, that brings us today’s recipe. When searching for appropriate muffin recipes, I hardly expected to find a gluten-free one, let alone a good one. Let (further) alone one from the 60s. But when I opened my oldest copy of The Joy of Cooking, there it was, with the laconic and unhelpful title, “Rice Flour Muffins”. No description was given, no hint as to the result, other than to say that they would be “less crumbly” if marmalade was added. Because they sounded so interesting — made with little more than rice flour, milk, and leavening — I had to try it. But I didn’t have high hopes, not especially after my recent foray into the world of gluten-free baking, which produced considerably more duds than successes. But I was bolstered partly by the thought of fodder for my quarterly redo-themed week, and partly by the thought that if a gluten-free recipe had made it into The Joy of Cooking in the 60s, it at least had to be half decent. So I mixed the modest ingredients together, more curious than anticipatory, and pushed them into the oven. What came out 12 minutes later were unassuming little things, blushing a pretty brown around their edges and up to their tops. The squat things probably weren’t going to win any beauty contests, but they had their own distinct charm. They turned out a bit flat, most likely due to the absence of a gluten structure to trap any leavening gases, but they were not at all dense inside. Rather, they were fluffy and light, and were a gorgeous pale ivory color. One of my main concerns when mixing was the relative lack of flavor-producing ingredients, such as sugar and fat. They were there, but in such small amounts (compared to other muffin recipes) that I wondered what good they might do. But after one bite, I realized that I had no reason to worry. The overall taste was intriguing and sweet, far more so than I had imagined they would be. But rice flour itself has a notably sweet flavor, unlike wheat flour, which tastes bland. That sweetness was immediately apparent; it was the complex sweetness of grain, not the simple one-note taste of refined sugar. The tiny bit of orange marmalade, though mild, recalled a citrusy rice pudding; however, it added no noticable sweetness itself. The rice flour I used (Bob’s Red Mill) has a relatively fine grain, and the resulting texture was somewhere between cornbread and a typical muffin: not grainy, but not perfectly smooth either. Arrowhead Mill makes a slightly coarser rice flour; I imagine the texture would vary accordingly. 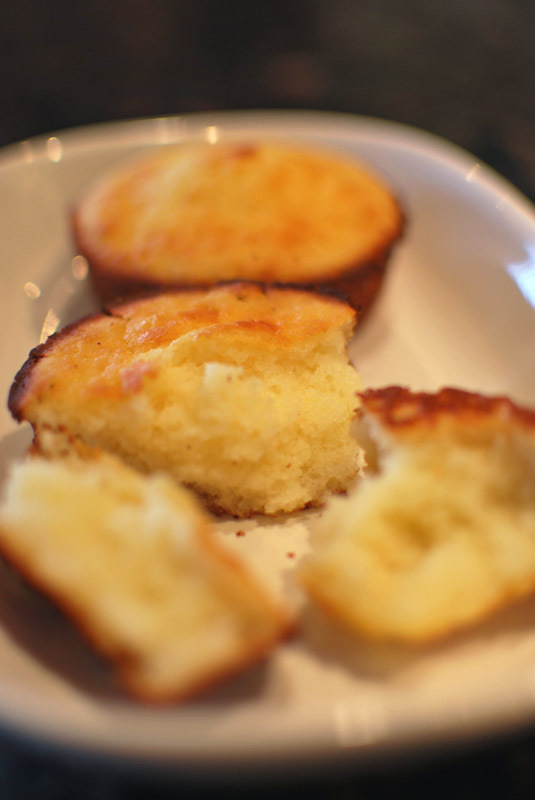 Overall, the muffins were tender and soft, and the edges were as crisp as if they’d been fried. The characteristic slight chew of the rice flour were one of the few cues that they weren’t standard wheat-flour muffins; if I hadn’t made them myself, I’d never have thought so. These muffins surprised and pleased with their ease, their gentle flavor, and their uniqueness. I would definitely make them again, and keep people guessing as to their secret: they’re from the 60s! 1. Preheat oven to 450º F. Grease 12 standard-sized cups of a muffin tin. 2. In a bowl, whisk together the rice flour, salt, and baking powder. Blend together the butter and marmalade until smooth. Beat in the egg. Add the egg mixture and the milk to the dry ingredients, and whisk until just blended, using as few strokes as possible. 3. Divide the batter evenly among the prepared muffin cups. Bake at 450º F for 12 to 15 minutes, or until golden brown on top. Remove from the pan, and transfer to a wire rack to cool slightly before serving. 1. Instead of using marmalade, you can use 2 tablespoons of sugar, or 1/8 cup of raisins.